With Readly you can read Duchess 75 - Britain's Most Powerful Steam Locomotive and thousands of other magazines on your tablet and smartphone. Get access to all with just one subscription. New releases and back issues – all included. 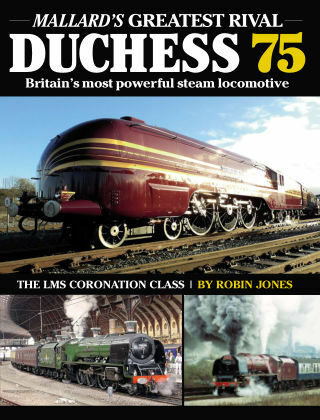 This publication, from the editor of Heritage Railway magazine, tells the story of the LMS Princess Coronations, a class which dazzled at the 1939 World’s Fair and which included some of the most powerful steam locomotives built for use on the British network, including No. 46233 Duchess of Sutherland and No. 6229 Duchess of Hamilton. While it was Mallard, centre of one of the greatest celebrations ever held in railway heritage during 2013, which set the world steam speed record in 1938, the Duchesses are widely acknowledged to have been more than capable of eclipsing the mark... given the same track and conditions. But the record books show the A4 with the record. This publication charts the history of the competition between the two as they raced to establish the fastest route from London to Scotland. LMS chief mechanical engineer, Sir William Stanier, is profiled as are each of the 38 Duchesses that were built.